Head to the Fulton River District for exciting events and dining deals at Chicago French Market (131 N. Clinton; 312-575-0306). Check out upcoming events below, and remember to follow Chicago French Market on Twitter and become a Fan on Facebook. Monday, March 8 from 7:30 a.m. - 7:30 p.m.
To honor the economic, political and social achievements of women past, present and future, Les Fleurs will give a free flower to every woman in the market. Visit Les Fleurs at the southwest corner of the market. Call (312) 463-1111 for more information. Tuesday, March 9th at 5:30 p.m.
Stop by and watch Louie make his famous Pico de Gallo and Shrimp Ceviche. The demo takes place starting at 5:30 p.m. in the Chicago French Market's public dining area to the rear of the market. Wednesday, March 10 - 5 p.m. - 7 p.m. Lombardy Chamber of Commerce and Isola, a local vendor of Italian products, join Pastoral in this tasting of Italian cheeses featuring Gorgonzola Dolce, Taleggio and Mascarpone. Thursday, March 11 4:30 p.m. - 6:30 p.m. Try a vast array of voluptuous white wines. Friday, March 12 5 p.m. - 7 p.m. The Lombardy Chamber of Commerce and Isola, a local vendor of Italian products, join Pastoral in this tasting of Italian cheeses featuring Gorgonzola Dolce, Taleggio and Mascarpone. Tuesday, March 16 4:30 p.m. - 6:30 p.m. Celebrate St. Patrick's Day with a tasting of beers from Chicago's own Goose Island Brewery! Thursday, March 25 4:30 p.m. - 6:30 p.m. Taste a wide variety of Italian and American red wines. Join Chicago Chocolate Tours for a delicious tasting at the Market! Sweet stops include Canady Le chocolatier, Vanille Patisserie, Pop This, Sweet Miss Giving's and Delightful Pastries. A champagne toast at N9NE/ghostbar will follow immediately after the tour and all guests will recieve a special goody bag! Advance registration is required. For more information, visit http://www.chicagochocolatetours.com/events or email info@chicagochocolatetours.com. 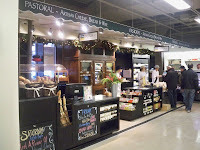 Join local food blogger Dana Joy Altman of Real Food Rehab at 10:30 a.m. every Saturday throughout the month of March for a free 45 minute tour of Chicago French Market. Samples are included! Meet her in the public dining area to the rear of the market. 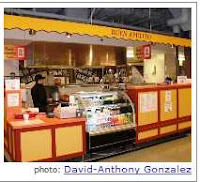 Eat at one of Chicago French Market's paticipating food vendors now through April 1 and bring your receipt to the Gene Siskel Film Center for a 20% discount on your movie ticket! 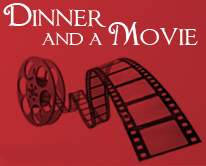 Or, purchase a movie ticket at the Gene Siskel Film Center and bring your ticket stud to one of the participating vendors for 20% off your total meal (ticket stubs are good for one use only). Participating Vendors: Chicago Organics, Chundy's Bistro, City Fresh Market, FLiP Crepes, Frietkoten Belgian Fries and Beer, RAW., and Saigon Sisters. More information on the Gene Siskel Film Center. Enjoy a Free Coffee...with the purchase of any tasty breakfast crepe from FliP Crepes! Now thru April 30, 2010. Only valid with coupon. Stay tuned for more upcoming events from Chicago French Market!